Join us: Americans deserve free, fair, and secure elections. We’re ensuring that every eligible citizen can register to vote in a convenient, fair, and secure way that’s good for voters and administrators alike. By modernizing our elections, we ensure our systems are secure and efficient, saving states money and safeguarding citizens’ votes. 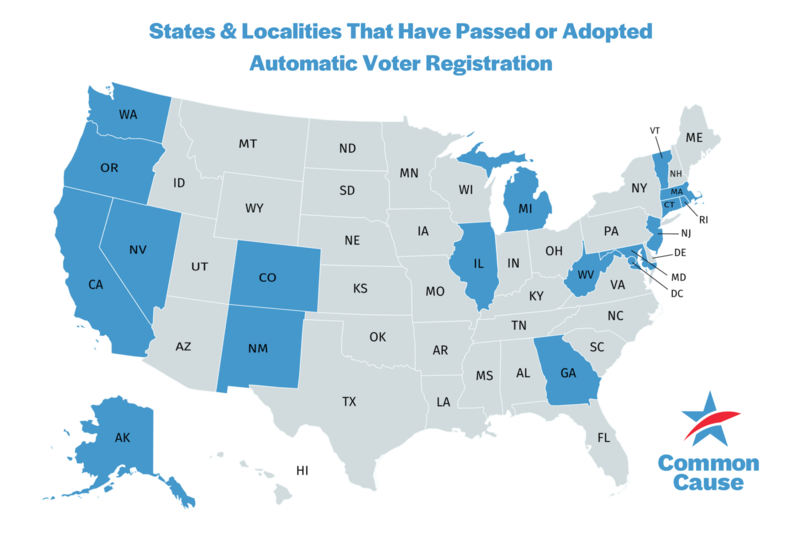 Automatic Voter Registration: Automatically registering eligible voters through the office of motor vehicles and other government agencies is the best way to streamline our voting systems, while also keeping them safe, accessible, and up-to-date. Election Day/Same Day Registration: Allowing eligible citizens to register and vote on Election Day and during an early voting period. Online Voter Registration: Allowing eligible citizens to register to vote safely and conveniently or update information via secure government websites. Pre-Registration for High School Students: Allowing eligible 16 and 17-year old high students to pre-register to vote, so that when they turn 18 their registration will automatically be activated. Ensure that all eligible citizens get registered and can cast ballots. Increase security of voter rolls by making registration automatic only for eligible citizens who don’t opt-out of the service when getting a driving license or doing other official business with the state, so long as they’re providing the agency with all relevant information needed to to establish eligibility. Reach eligible voters – no matter their party preference – who haven’t registered so that they can participate in our democracy. Thanks in part to the advocacy of our more than 1.3 million members and activists, AVR already has passed or been adopted in some form in 17 states (Washington, Oregon, California, Alaska, New Mexico, Colorado, Illinois, Georgia, West Virginia, Maryland, New Jersey, Connecticut, Rhode Island, Massachusetts, Vermont, Michigan, and Nevada), plus the District of Columbia. Utah also recently modernized its voter registration process in 2018. Common Cause helped lead campaigns for AVR in states including Massachusetts, Maryland, Rhode Island, Illinois, Oregon, New Mexico, and California, often with bipartisan support. We’ve also encouraged states to adopt the reform administratively where available. Automatic voter registration is key to increasing participation and amplifying citizens’ voices in the process. Automatically registering eligible voters through DMVs and other government agencies is the best way to streamline our voting systems, while also keeping them safe, accessible, and up-to-date. We know automatic voter registration works. The U.S. Election Assistance Commission released a report in 2017 showing that Oregon’s automatic voter registration law added 375,000 new voters to the rolls in just 18 months – a 12% increase in the state’s registered voters. Similarly, Vermont’s automatic voter registration law registered more than 12,300 new voters in the first six months after its enactment, according to a recent report by the Vermont Secretary of State. Let voters register on Election Day! Every eligible voter should be able to make their voice heard at the ballot box. Election Day Registration provides commonsense updates to modernize our voter registration system and make sure it’s as fair, accessible, and efficient as possible. Sign our petition now and tell Congress to bring Election Day Registration to all 50 states — and ensure every eligible voter can be heard!